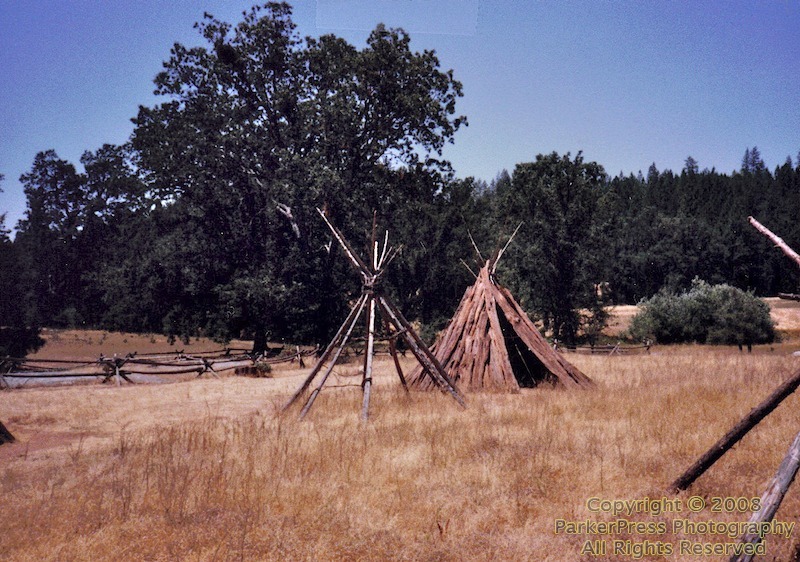 The native people of this area were the Nisenan of the Maidu group. Their southern boundary was the Cosumnes River, and the northern boundary was approximately the Bear River. 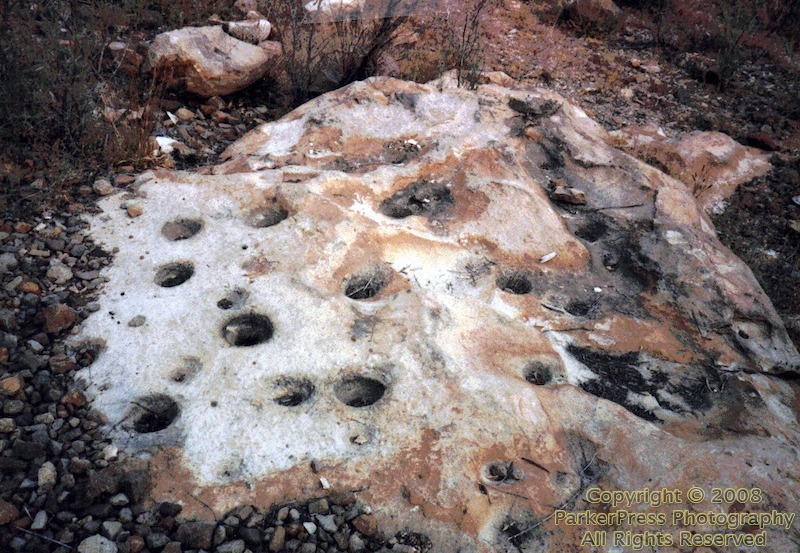 However, there may have been some overlapping of the Miwok and Maidu people in this area. 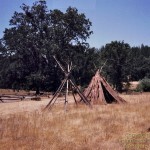 The Miwok and Maidu people had a very similar culture although they had slightly differing dialects. These people lived at the lower elevations. 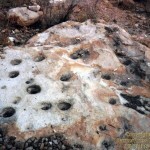 The area above the 3000 foot level to the high mountain ridges was mainly used as a summer hunting and gathering place. Like all native people in times past, the Nisenan adjusted their living style to utilize the natural environment. They were hunters, gatherers and fishers and preferred territories that crossed the differing life zones from lower to higher elevations to allow for a greater variety of food. They lived at lower elevations on south facing slopes or clearings that were accessible to water. They traveled up into the mountains in summer and fall for four to five days at a time to gather food for winter storage. Most individuals seldom traveled more than twenty miles from their home village. Only chiefs and other important people would make social visits to outside groups. A village might consist of as few as 5 to 6 families or might be comprised of as many as 500 to 600 individuals. Several villages shared one chief who ruled by influence rather than power and could be deposed by being ignored if no longer respected by the people. The older men of the villages usually chose the chief. A young girl was completely trained in the skills of homemaking, child care, and birthing by the age of 13. The mother and aunts did the training. A young boy was considered to be a man by the time he had reached age 15 and was trained to provide for a family. The man came courting the girl and if she didn’t leave his company, it was considered as acceptance of the courtship. Their mutual agreement was all that was needed for them to be considered married. A “divorce” was simply at the wish of either party. No one owned the land but they protected their area from outside groups. They used nature without destroying it and practiced “creative stewardship” with the habitat, as their livelihood actually depended on the environment and they would suffer if it was damaged. They set fire regularly to the undergrowth in the forests to make traveling easier and to provide fresh green growth for the deer, thus providing better hunting. A granary used for acorn or seed storage. 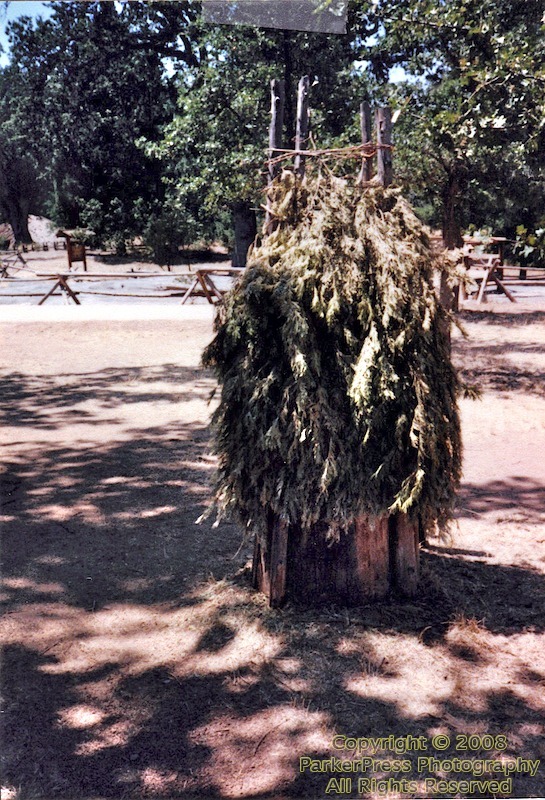 It was built over a tree stump and had a cedar covered, pole frame. 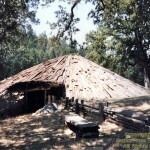 This granary is at Chaw-Se, a reconstructed Miwok village located off of Highway 88 near Pine Grove, Amador County. 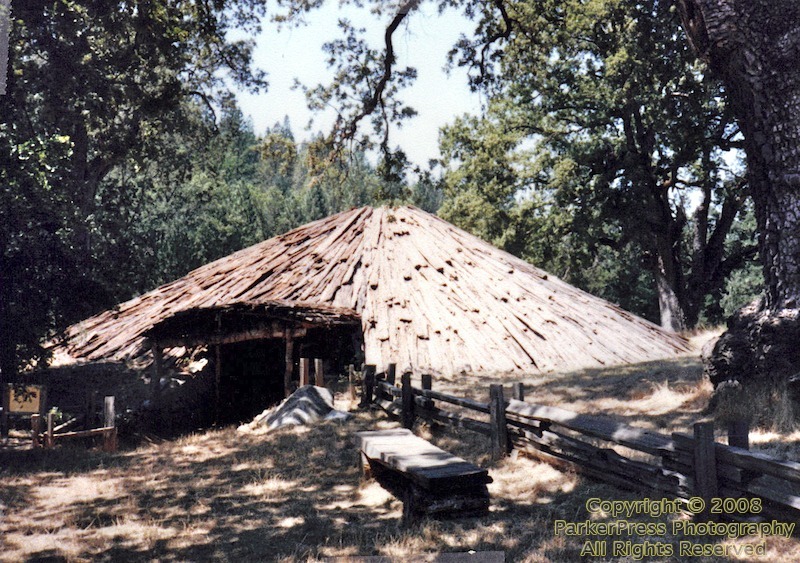 The granary and buildings of the Miwok at Chaw-Se are similar in design and construction to those of the Nisenan. Acorns, preferably from the black oak tree, were the mainstay of the Nisenan diet. A large black oak could yield 200 to 300 pounds of acorns every other year. The Nisenan were competing with the insects, birds and animals but often gathered and stored a two year’s supply, sometimes using laurel or bay leaves as preservatives. The women would gather at a spot with large bed rocks, where they could visit and grind the acorns into a fine meal. 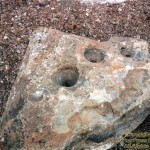 The rocks would become pocked with holes after years of grinding. One of many Indian grinding rocks at Sly Park campground. This photograph was taken during the low water year of 1988. Before eating the acorns, the bitter tannic acid needed to be removed. One method required removing the shell and grinding the meats between stones. The meal was then put into a leaf lined hole in the ground. Water was poured over the meal several times. The water would drain away taking the tannic acid with it. This process is called leaching. Another method of leaching was to bury the unshelled acorns in mud for several months to one year. The acorns were then shelled and ground into meal. The meal was added to a basket of water. Hot rocks from the fire were added to cook the mixture. It was necessary to stir the rocks to avoid burning the basket. The result was acorn mush. Vegetables could be added for flavor. An alternative to making acorn mush was to mix the acorn meal with water and bake it like a pancake, on a hot rock. The teeth of many natives were ground away by the small rock fragments left in the meal as the acorn was ground between the rocks. Small game and fish were the main supplement of the Nisenan diet. They also dug worms to be used in a soup and caught grubs, grasshoppers, bee and fly larvae, caterpillars, and crickets. The natives chased the grasshoppers into cone shaped holes in the ground by beating the earth with brush. They then soaked the grasshoppers in salt water before roasting and eating them. The Nisenan also dug roots, and gathered the native berries: blackberries, huckleberries, coffee berries, and grapes. Cold water poured over Manzanita berries made a sweet cider-like drink. Homes were mostly poles leaned together in a cone shape and tied with grapevines at the top. These poles were covered with bark, skins, or brush. Brush was most often used in the summer. Larger ceremonial homes were often bark covered or earth covered mounds built over an excavated pit with forked tree trunks holding up long logs that supported the roof. Nisenan clothing and ornamentation was scant. In mild weather the men usually went naked or wore loin cloths made from leather or woven tule grass. 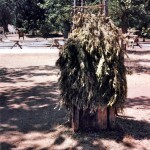 The women wore a grass or pounded bark apron. A rabbit hair robe trimmed with squirrel or a deerskin was generally used as a bed cover, but might be worn over the shoulders on cold winter days. The men wore their hair shoulder length and the women wore their hair long. Most of the Nisenan adults twisted their hair into a knot or tied it at the back of the neck. Both men and women had pierced ears and wore bone, stone, shell or feather ear ornaments. Moccasins were seldom used, but a round snowshoe of grapevines strung with thongs was fashioned for traveling in winter snow. As the white men came to California, The Indians began to adapt their manner of dress to the white man’s way of dressing. The Nisenan had almost no written language and passed information, history and stories from generation to generation orally. The religion was mainly concerned with the renewal of nature and prevention of disaster. They burned their dead along with all the deceased person’s possessions, then buried the ashes. They loved to participate in games of skill, endurance, and strength. They played a type of football with a round skin covered ball. A favorite betting game involved one player holding two bones, one of which was marked. He rapidly switched them from hand to hand and challenged his opponents to guess which hand held the marked bone. They also enjoyed singing and dancing. Instruments and music were simple and repetitive with a limited range in scale. Rattles were made of dried deer hoofs or cocoons filled with pebbles, tied to a stick. A simple clapper was made by splitting an elderberry stick lengthwise most of the way down then wrapping the uncut end to keep it from splitting further. This was clapped against the hand or body in rhythm. Whistles were made of hollow bird bones or elderberry sticks. There were no hide covered cylindrical drums. The drums were foot drums made by laying a board over a hole and stomping on the board while dancing, or pounding on the board with a pole. The Round House located at Chaw-Se. This building is used for ceremonies and dances. There seems to have been some prejudice against all of the natives of California, but they were simply a quiet, peaceful people, living according to their own needs and standards. When the white men came here seeking gold, the natives found themselves competing with the white men for food and land. A great many of the local natives died of starvation and white men’s diseases to which they had no natural immunity. Most of those that survived took on white men’s customs, losing touch with their own heritage. The descendants of these people, as with many minority groups, are once again taking pride in their ancestory. They are recalling and cherishing the customs and traditions of their forefathers. A good example of this is the construction of the Chaw-Se State Park and the celebrations held there.